This time lets see which improvements were delivered for the Batch Mode processing for the SQL Server 2014 CTP1. Batch Mode query execution was introduced in SQL Server 2012 specifically for the Columnstore Indexes. One of its differences to the traditional Row Mode is that it is processing data joined together in chunks of 1000 units instead of traditional 1 by 1, thus guaranteeing more CPU efficiency for the big amounts of data. Since Columnstore Indexes are being used specifically for the tables with a lot of millions of rows, this is exactly where the Batch Mode is shining. In the SQL Server 2012 the batch mode implementation was very limited, with just a couple of Query Execution operators being supporting Batch Mode, and in order to get it activated one would have to completely rewrite the query, following the suggestion published by Microsoft. I downloaded and installed Contoso BI database on both of my Virtual Machines: on SQL Server 2012 and on the SQL Server 2014 CTP1. This all seems to be quite clear, but what about SQL Server CTP1 and the NonClustered Columnstore Indexes and Clustered Columnstore Indexes ? 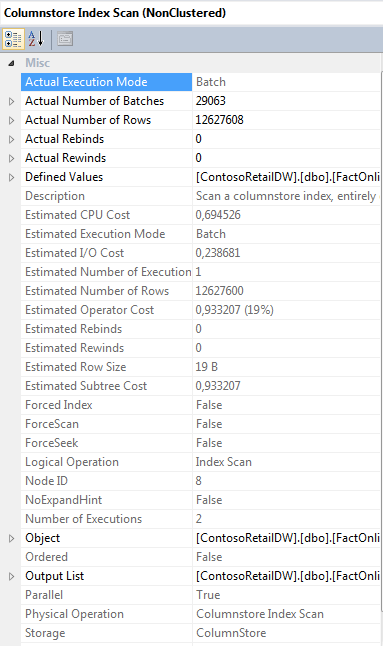 Yes, you are looking at the correct plan – a simple & direct query is using Batch Mode even with the Nonclustered Columnstore Index ! The difference between execution plans in SQL Server 2012 & in SQL Server 2014 is that Steam Aggregate from 2012 became Hash Match (Partial Aggregate) in 2014 and that both operations (Index Scan & Steam Aggregate) are running fully in Batch Mode. Here you have the screenshot of the “Statistics IO”: I do not know why the number of reads is so significantly higher, since the difference between the sizes of the Columnstore Indexes were around 15 MB and it does not represent even 10% of the total space occupied by the Nonclustered Columnstore Index in that case. Then I ran the SELECT queries again and the execution plan was pretty much the same as for the NonClustered Columnstore Indexes, though the difference in performance were more visible – the first query got better results than the CTE one, though they are definitely not in orders of magnitude, but around 5-8% on my VMs’. I will make a guess, that this is exactly the Workfiles serving for the Hash Indexes & Hash Aggregates described at the respective MSDN article, but it is very interesting that CTP1 is making mention of them.